The weekend was delightful - beautiful Autumn sunshine combined with some relaxing sewing time. I've put to good use my leftover Anna Maria Horner fabrics. 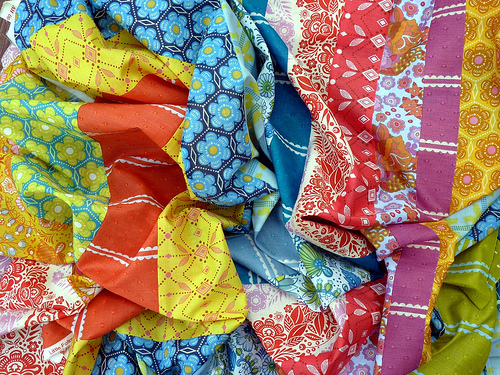 Totally inspired by this quilt featured on Calico and Ivy. So much for using up my leftover fabrics, I now think I need more. I love the little folks! And that inspiration quilt is gorgeous. I bet it is wonderfully soft! What a fun inspiration quilt! Love the sneak peek. great choice and I'm sure you will love the finished quilt. I actually saw this quilt at Calico and Ivy this morning and was blown away by the sheer softness of the fabric and its simplicity to make - I think I may join in the fun of making one too, especially now that Calico and Ivy is my local fabric shop due to our recent move from Melbourne to Perth!!! Looks beautiful - and you can never have too much fabric. Finishing off leftovers just gives you a good excuse to buy more!